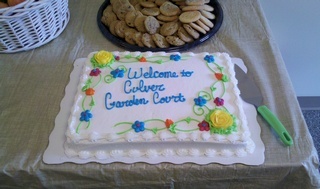 Yesterday was the Open House and Ribbon Cutting Ceremony for Culver Garden Court. I want to thank all of the Culver people that made this project possible that turned out for the event. The Culver Town Council was represented by Ed Pinder and Bill Githens. (Ralph Winters, a former Town Council member who was instrumental in getting this project approved, was there as well.) The Plan Commission was represented by Ralph Winters. The Culver Redevelopment Commission was represented by Jerry Ney. Pete Trone also came. (Pete was instrumental in helping get the needed variances while he was on the Culver BZA.) The Culver Chamber of Commerce was represented by Sue McInturf, Tony Sellers and Greg Fassett. Reverend Liechty, President of Garden Court, Inc., was the keynote speaker. He made a nice speech introducing the attending dignitaries and giving some history regarding the organization. He allowed me to speak and I explained how we had worked to make this project happen for over 10 years and through four Town Managers. We both thanked Wade and Claudia McGee for making the property available. I also congratulated the various Town Boards and Commissions for taking the additional steps to annex the surrounding 80 acres, change its zoning and start water and sewer lines to open the area to additional affordable housing. Reverend Liechty will be stepping down as President of Garden Court and retiring from the board when they elect officers this coming November, so after 7 Garden Court projects, Culver Garden Court will be the last project where we work with him. I took the chance to publicly thank him for the opportunity to work with him and thanked him for his guidance and friendship through the years. All in all it was a good day. The sun was shining. There was a good turn out. I heard nothing but good comments about the project.